It is a Challenge Coin. The one you got here signifies that the person who handed it out to you thinks you are awesome. And so is working with you. So please, accept it as a token of respect – and know that anyone who bears the same coin is also worthy of that respect. You might want to work together too, or at least enjoy a good drink with them! 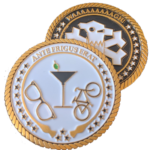 A challenge coin, just for hipsters, before it was cool. …are given to members upon joining an organization, as an award to improve morale, and sold to commemorate special occasions or as fundraisers. The tradition of a challenge is the most common way to ensure that members are carrying their unit’s coin. The rules of a challenge are not always formalized for a unit, and may vary between organizations. The challenge only applies to those members that have been given a coin formally by their unit. This may lead to some controversy when challenges are initiated between members of different organizations and is not recommended. The tradition of the coin challenge is meant to be a source of morale in a unit, and forcing the challenge can cause a reverse effect. The act of challenging is called a „Coin Check“ and is usually loudly announced.